Որդի — Գաբրիել (Դեվիդ Հարիսի հետ ամուսնությունից). ↑ Ստուրուա, Մ. Անեռանդ Ջոան. ↑ Պիսիգին Վ. դարի 50-60-ականների անգլո-ամերիկյան երաժշտության մասին գրքերը. 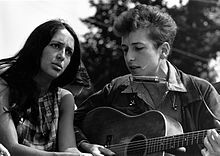 ↑ Post City Toronto–ի հարցազրույց, նոյեմբերի 2, 2011 թ․, — Q&A: Joan Baez on religion, the Occupy movement and her rare T.O. concert appearance.